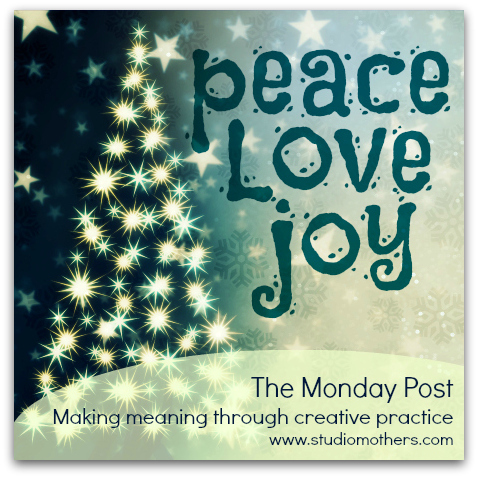 If you celebrate Christmas, have a joyous week. May your holiday be full of creativity in many merry ways! Remember that a regular creative practice — a daily practice, if possible — is key to staying in touch with how you make meaning. Aside from all of the holiday bustle, my primary intention this week is to resume my daily meditation practice. I’ve also been journaling up a storm, which I intend to continue. This week I would like to take 35-45 minutes in the mornings to do a bit of yin yoga. I just discovered it and fell in love with it and would like to make it a part of my daily routine. Wonderful! I( recently reminded myself that no matter how busy I am, I can commit to a minimum of five minutes of yoga every morning. Just because I can’t take a 90-minute class doesn’t mean I should skip it altogether.) I’m not familiar with yin yoga — going to check that out!